I’ve been keen to go to Handsome Her since it opened, but I thought I’d wait a bit for the opening rush to die down. I finally got there last week. It was worth the wait. Looking at the menu I was paralysed by choice. Every dish on the small menu sounds delicious, but I finally settled on the ‘Park Yeon Mi’ (all the dishes are named after notable women). 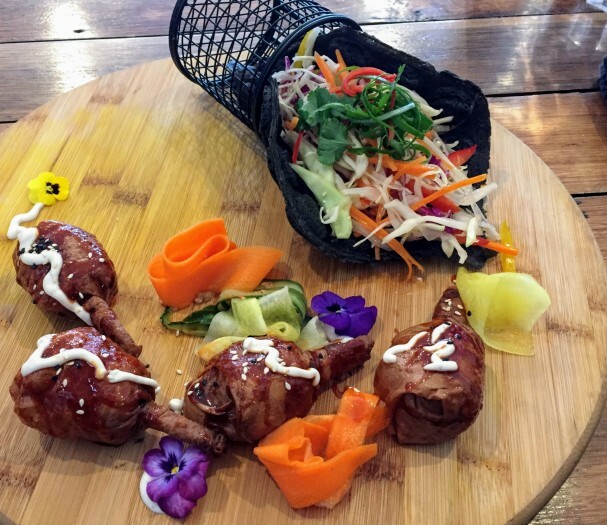 My dish was delicious, four crispy soy based drumsticks, with a sticky spicy sauce and tofu mayo, nicely contrasted with some pickled vegetables, cucumber kimchi, coleslaw and a charcoal waffle. The drumsticks were not what I expected inside, they’re not solid but a tightly wrapped coil of a sheet of soy mock meat. Delicious anyway. The food here is so beautifully presented. Each dish I saw come out was a piece of art. I guess this is to be expected when the owner came from The Glass Den where the food is equally pretty. The coffee is good too. The cakes in the cabinet looked fabulous, but I was too full to try them. Here are just a couple to tempt you. Ignore the ratings on social media, they are brought low by reviewers, who in all probability have never been to the cafe, objecting to the completely voluntary 18% surcharge to highlight the gender pay gap. I saw no evidence of men not being welcome. The staff were friendly to everyone. I should really name this post Handsome Her 1 because it is certain that there will be posts 2,3,4… as I eat my way through the menu.